In today’s Gospel reading according to St. Luke, Jesus helps Simon and his fishermen catch more fish than they ever had. By trusting Him to lower their nets again, the nets are so full they almost burst! One can only imagine their delight and joy at such a bountiful harvest. Success is exhilarating. Instead of turning to Jesus and asking him to come along with every trip out, Simon falls to his knees and professes he is a sinner and Jesus should depart from him. How did he realize that this man was from God? How did he recognize his own failings enough to say he wasn’t worthy of being around such a holy and powerful person? Instead of turning back for more successes and monetary gain, Simon, James, and John left their boats. They literally “left everything and followed him.” What faith! What incredible trust. Secondarily, Jesus told them they would be fishers of men instead of fish. Instead of the job they knew and were trained for, he had a new job in mind. Again, leaving what you know and what you have done your whole life? Departing from your habits to follow a man who inspired you? Pretty profound trust. Jesus calls us to do more than chase success, fame, or popularity. These earthly accolades are not what we are to trek towards. In fact, when we receive them, whether it be in the form of a promotion at work, being selected for a high profile volunteer position, or elected to an office in our community, that “success” isn’t the end of the road. We have the opportunity to seek God, truth, beauty, goodness as our final destination. Not that we shouldn’t enjoy success, but it’s a means to an end, not the end itself. Jesus is calling us for something beyond what we are comfortable with. Jesus asks us to leave our habits, our ways we know, and reach for something that is beyond the day-to-day grumblings and work. We do not have to abandon our careers or families to follow Him. Quite the contrary. Our approach to the every day can be infused with joy. Love can drive our actions and words. A kind request at work instead of a gruff command. A gentle correction of our children instead of a frustrated shout. 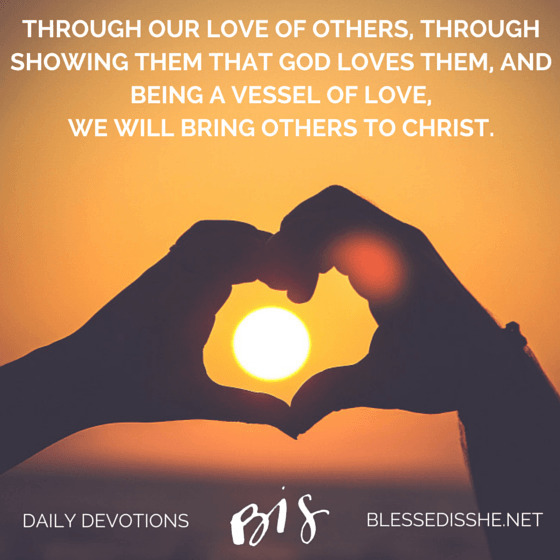 Through our love of others, through showing them God loves them, being a vessel of love, we will bring others to Christ. 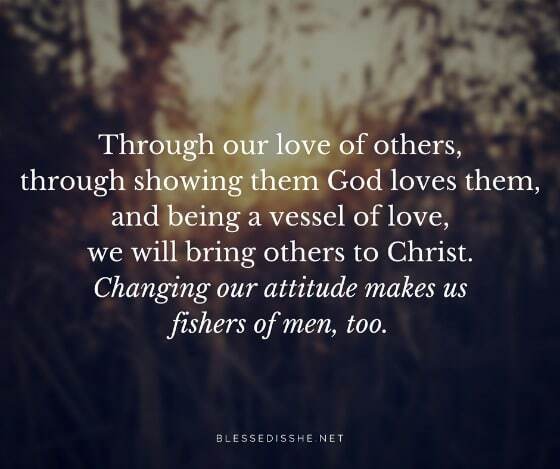 Changing our attitude makes us fishers of men, too.